To read the thirty evidence papers submitted to the Senedd Culture Committee as a layperson leaves two emotions in its wake. The first is bewilderment. There are so many organisations, each with its own heritage, sense of mission, company culture, genre, board, membership, balance sheet, asset mix, volunteer and supporter group. The second emotion is awe. The arts are a garden that is luxuriant and in full blossom. Its surging spirit is Dionysus rather than Apollo. If the arts were to have a designer it would be a Gaudi rather than a Palladio. The task that the Committee has been set is a good one. For all the skill of the members and the civil servants behind them the reaching of a cogent outcome is probably beyond government's doing. The reason is that the arts in Wales are a chaotic system. That is not meant in the colloquial sense of disorder as a disparagement. The term is descriptive as used in system theory. They are stochastic in process encompassing both order and unpredictability. The slump in lottery income is an unpredictable event. But so too is Theatre 503, a grade one venue in theatre importance, when Chippy Lane delivers a showcase of performance thrill. From a critical standpoint the quality of the evidence submissions varies. There is no correlation between the size of an organisation and the sense and punch of the writing it delivers. “ We believe that it is important for Wales to have a thriving creative economy” writes a big outfit “and to have an innovative and successful business sector, for which investment in the arts and culture is vital.” This is writing as flock wallpaper. “This helps brand Wales as a forward-looking nation and one that welcomes investment and new business, making it a desirable place to live in and visit.” This is big and baggy corporate waffle. There is no such thing as a forward-looking or a backward-looking nation. “We very much want to see the promotion of joined up policy and practice by Welsh Government and local authorities; for these governing bodies to act as enablers for creative activities.” The author of this can be guaranteed to be an observer not a participant in the arts. Demand for public subsidy is always greater than supply so it is just as Lenin said of politics “who gets what?” A state-mediated culture makes choices. In theatre it can opt for people who are performed around the world; think Burke, Harrower, Grieg, McPherson, Lee Hall. Or it can more or less crush drama and comedy with a liking for pageantry. Pageants can be fun but they not exportable or durable. The contrast in quality of writing from the organisations who actually do stuff, and have done so for a couple of decades, is noticeable. The documents from Mid Wales Opera and Theatr Na nÓg are properly composed and structured and are rich in description and detail. The sense of mission is clearly enunciated. And they get to it; the two documents put together run to an economical 2400 words. Mid Wales Opera in its first paragraph declares its ACW funding and its overall budget. Individual donations are a good sum for a company in a rural location. The sums from its major contributors are given. The public of Wales knows exactly what it is giving and then the company lays out exactly what Wales gets in return. It is unambiguous and delivered in a clear language. The third item, the tour of “Eugene Onegin” with Ensemble Cymru, will be reviewed here in five days' time. Earned income and ticket sales account for 15% of the total. If the company's level of candour and disclosure were made mandatory across the sector the culture would be stronger. But, as the 45th would put it, “it's not gonna happen, “it's not gonna happen”. “Acis and Galatea” and “Tom” are by any standard in different places on the spectrum of performance. But Mid Wales Opera & Theatr Na nÓg have more that unites them than separates them. Both have a staff of four. Both explicitly regard critics as a part of the ecology. 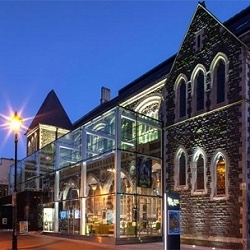 Theatr Na nÓg- “we contribute to the Wales Critics Fund which can support those based in Wales to review our work.” Both illustrate aspects of the financial picture. Theatr na nÓg contributes good detail on venues, fees, risk and pricing. A public document tells the Welsh public what it gets, in this case a £1m box office for “TOM”.